the front parking, tail, license plate and instrument panel lights come on. the headlights come on and all the other lights remain on. Headlight Type B is equipped with front LED accent lights. Turn on the headlights, front parking, tail, license plate and instrument panel lights automatically when it is dark. 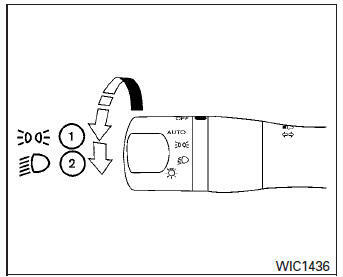 The autolight system will turn on if the windshield wipers make four continuous passes (USA only). Turn off all the lights when it is light. Keep all the lights on a period of time after you turn the key to OFF and all doors are closed. 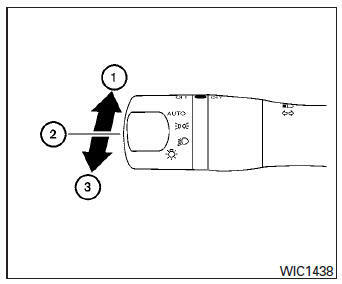 Turn the headlight switch to the AUTO position 1 . Turn the ignition key to ON. The autolight system automatically turns the headlights on and off. Initially, if the ignition switch is turned OFF and a door is opened and left open, the headlights remain ON for a period of time. If another door is opened while the headlights are on, then the timer is reset. Be sure you do not put anything on top of the autolight sensor located in the top side of the instrument panel. The autolight sensor controls the autolight; if it is covered, the autolight sensor reacts as if it is dark out and the headlights will illuminate. If this occurs while parked with the engine off and the key in the ON position, your vehicle’s battery could become discharged. 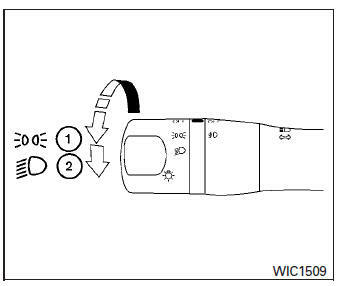 To select the high beam function, push the lever forward. The high beam lights come on and the light illuminates. 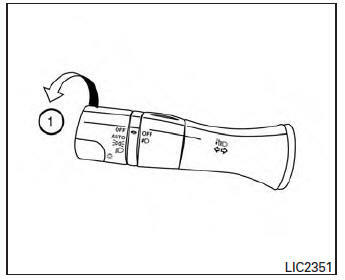 Pull the lever back to select the low beam. Pulling and releasing the lever flashes the headlight high beams on and off.